Explosive eruptions produce a mixture of volcanic ash and other fragments called tephra, rather than lava flows. The word lava comes from Italian, and is probably derived from the Latin word labes which means a fall or slide. The first use in connection with extruded magma (molten rock below the Earth's surface) was apparently in a short account written by Francesco Serao on the eruption of Vesuvius in 1737. Serao described "a flow of fiery lava" as an analogy to the flow of water and mud down the flanks of the volcano following heavy rain. Mafic or basaltic lavas are typified by their high ferromagnesian content, and generally erupt at temperatures in excess of 950 °C (1,740 °F). Basaltic magma is high in iron and magnesium, and has relatively lower aluminium and silica, which taken together reduces the degree of polymerization within the melt. Owing to the higher temperatures, viscosities can be relatively low, although still thousands of times higher than water. The low degree of polymerization and high temperature favors chemical diffusion, so it is common to see large, well-formed phenocrysts within mafic lavas. Basalt lavas tend to produce low-profile shield volcanoes or " flood basalt fields", because the fluidal lava flows for long distances from the vent. The thickness of a basalt lava, particularly on a low slope, may be much greater than the thickness of the moving lava flow at any one time, because basalt lavas may "inflate" by supply of lava beneath a solidified crust. Most basalt lavas are of ʻAʻā or pāhoehoe types, rather than block lavas. 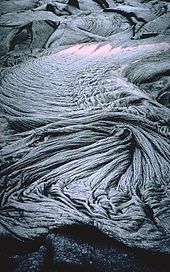 Underwater, they can form pillow lavas, which are rather similar to entrail-type pahoehoe lavas on land. Ultramafic lavas such as komatiite and highly magnesian magmas that form boninite take the composition and temperatures of eruptions to the extreme. Komatiites contain over 18% magnesium oxide, and are thought to have erupted at temperatures of 1,600 °C (2,910 °F). At this temperature there is no polymerization of the mineral compounds, creating a highly mobile liquid. Most if not all ultramafic lavas are no younger than the Proterozoic, with a few ultramafic magmas known from the Phanerozoic. No modern komatiite lavas are known, as the Earth's mantle has cooled too much to produce highly magnesian magmas. The term "lava" can also be used to refer to molten "ice mixtures" in eruptions on the icy satellites of the Solar System's gas giants. (See cryovolcanism). The base of a lava flow may show evidence of hydrothermal activity if the lava flowed across moist or wet substrates. The lower part of the lava may have vesicles, perhaps filled with minerals ( amygdules). The substrate upon which the lava has flowed may show signs of scouring, it may be broken or disturbed by the boiling of trapped water, and in the case of soil profiles, may be baked into a brick-red terracotta. The word is also spelled aa, aʻa, ʻaʻa, and a-aa, and pronounced /ˈɑː(ʔ)ɑː/. 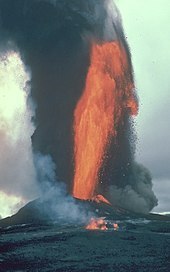 It originates from Hawaiian where it is pronounced [ʔəˈʔaː],  meaning "stony rough lava", but also to "burn" or "blaze". A lava fountain is a volcanic phenomenon in which lava is forcefully but non-explosively ejected from a crater, vent, or fissure. The highest lava fountains recorded were during the 1999 eruption of Mount Etna in Italy, which reached heights of 2,000 m (6,562 ft). However, lava fountains observed during Mount Vesuvius' 1779 eruption are believed to have reached at least 3,000 m (9,843 ft). Lava fountains may occur as a series of short pulses, or a continuous jet of lava. They are commonly associated with Hawaiian eruptions. Deaths attributed to volcanoes frequently have a different cause, for example volcanic ejecta, pyroclastic flow from a collapsing lava dome, lahars, poisonous gases that travel ahead of lava, or explosions caused when the flow comes into contact with water. A particularly dangerous area is called a lava bench. This very young ground will typically break-off and fall into the sea. ^ Pinkerton, H.; Bagdassarov, N. (2004). "Transient phenomena in vesicular lava flows based on laboratory experiments with analogue materials". Journal of Volcanology and Geothermal Research. 132 (2–3): 115–136. doi: 10.1016/s0377-0273(03)00341-x. ^ a b Harlov, D.E. ; et al. (2002). "Apatite–monazite relations in the Kiirunavaara magnetite–apatite ore, northern Sweden". Chemical Geology. 191 (1–3): 47–72. doi: 10.1016/s0009-2541(02)00148-1. ^ a b Guijón, R.; Henríquez, F.; Naranjo, J.A. (2011). "Geological, Geographical and Legal Considerations for the Conservation of Unique Iron Oxide and Sulphur Flows at El Laco and Lastarria Volcanic Complexes, Central Andes, Northern Chile". Geoheritage. 3 (4): 99–315. doi: 10.1007/s12371-011-0045-x.